Now is the time to invest in your teams. In this economic downturn (uncertainty), reassurance and fun is key. You need to inject a sense of belonging, trust and laughter. To that end, we are here to help you. Our activities are easy to read and easy to "lead". 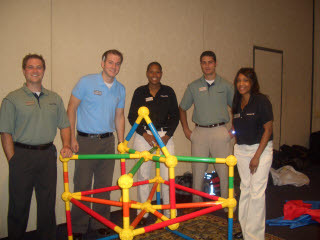 See our sample activity videos below. Are you like all other businesses or organizations? Did you know that...According to the Gallup Organization 52% of your workforce is disengaged and 17% are actively disengaged. They are costing you thousands of dollars each year due to lack of productivity. Studies show one of the major reasons for lack of productivity among employees is failure on the part of management to motivate them and meet their emotional needs. In other words, your staff may have relationship problems and not even realize it. According to Chief Learning Officer Magazine, mentoring programs fail because they are missing a very basic ingredient, trust. People lose interest. They don’t sustain relationships. People lose track of what the program is supposed to do, and it’s just not successful. •Pursuit of mastering the game - becoming proficient is something people love, AND when you get past the stigmas associated with playing...like: competing, losing, or even WINNING, what you find is that people just LOVE to play! YES! People LOVE a game that is engaging, challenging and worthwhile. Here is a BIG question for you to consider...Are you playing worthwhile games in the most cherished parts of your life? 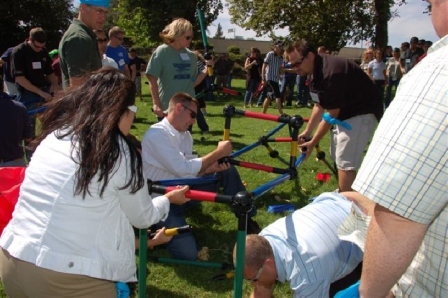 The BIG benefit for you as an organization is that if you play with your employees, you will learn things about them that you would never have learned under any other circumstances. You will learn about yourself and others will learn about you. There is nothing more fulfilling than transforming your experiences into something that adds value to the life of another. It's one of those sweet things that make life worth living and brings meaning to all of the hard work, heartache and moments of triumph. The most fulfilling time is when EVERYONE wins. If they win...then you win. When you think about it, this is true about many things in life. When you own a business, you only truly win in a sustainable way when your employees and customers win also. In your relationships, you only win when others win too. In your leadership roles in your community, church or company, you only win when the people "in your game, playing on your team" (as we would say it) win too. Let us show your organization how to play together, and then EVERY game you play will be one that you win! I would like to introduce you to an innovative solution that will help your company. This is literally “building” bridges within your group, department, division, or the entire company. 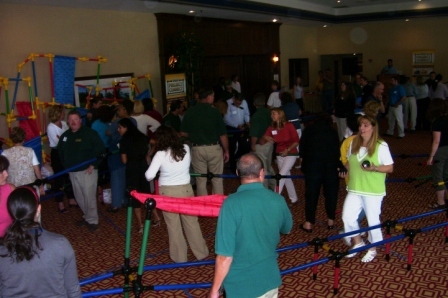 The Toobeez Experience is designed to build teamwork, opportunities for learning, reflection, risk-taking, group cooperation, problem solving, decision making and leadership skills while your members and staff are having fun and sharing laughter. How do you bridge the communication gap between departments, leaders and associates? 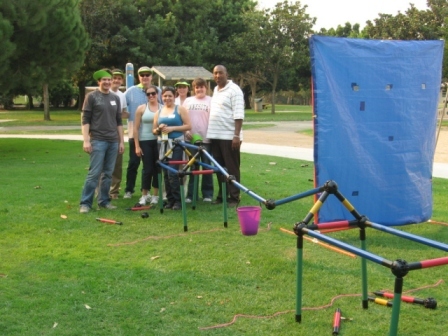 Using our giant toy product, regardless of age or background, and with our thought provoking activities. The Toobeez Experience brings people together. This is not the same old game show or scavenger hunt activity, nor is there a need to hire an expensive motivational speaker...it's TOOBEEZ!